Walter Anderson was born in New Orleans on 29 September 1903, the second son of George Walter Anderson, a grain merchant, and Annette McConnell Anderson, an artist who taught him a love of art, music, and literature. He grew up valuing the importance of art in everyday life and developed what would become a lifelong interest in mythology. He attended grade school in New Orleans, went to boarding school in New York, and was later trained at the Parsons Institute of Design in New York (1922–23) and the Pennsylvania Academy of Fine Arts (1924–28). He received a scholarship that enabled him to study and travel in Europe. He read broadly in history, natural science, poetry, art history, folklore, philosophy, classical and modern literature, and epic narratives of journeying. Anderson had long been interested in nature, but at Oldfields natural scenes began to appear in his watercolors and tempera paintings and in the large linoleum block prints he created. In 1947 he secluded himself in a cottage at Shearwater, where he wrote, painted, decorated pottery for the family business, and carved. He rowed the twelve miles to Horn Island, one of the barrier islands off the Mississippi Coast, an unspoiled natural landscape that became his home for long stretches of time during the last decade and a half of his life. “So much depends on the dominant mode on shore,” he wrote, “that it was necessary for me to go to sea to find the conditional. 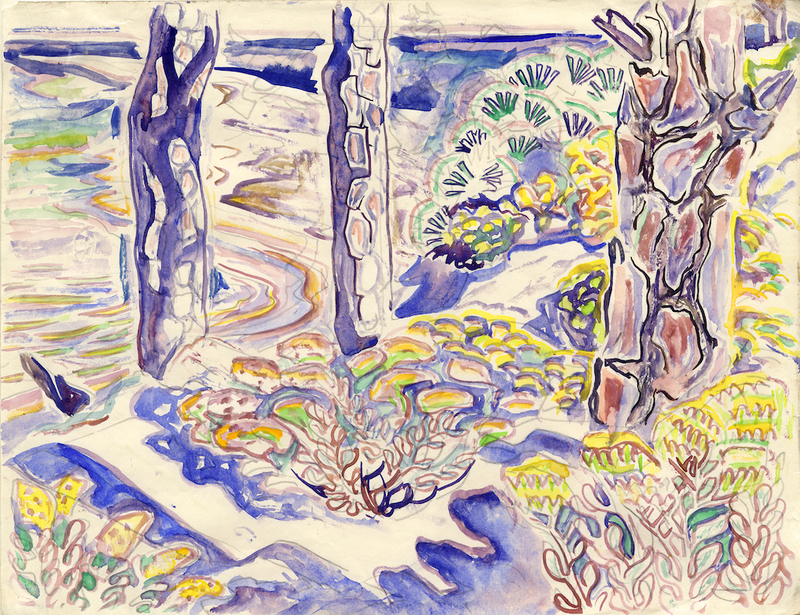 Everything seems conditional on the islands.” Anderson’s paintings and drawings captured the numerous species of flora and fauna in this pristine environment, as he illustrated birds, insects, animals, flowers, trees, shrubs, and any other natural life he saw while exploring the wild underbrush and coastal lagoons. He used the term realization to suggest his hope of becoming at one with the natural species he observed. On one occasion, he tied himself to a tree during a hurricane to experience the fury of nature. He documented everything he saw, from the life of a spotted frog to the near extinction of the brown pelican as a consequence of the pesticide DDT. Anderson kept ninety journals and logs recording what he experienced, writings mostly for himself that drew from his broad artistic and philosophical knowledge. Walter Anderson died of lung cancer in New Orleans in 1965. In honor of the centennial of his birth in 2003, the Smithsonian Institution mounted a major exhibition of his work. The Walter Anderson Museum was established in Ocean Springs in 1991. Much of Anderson’s work is there, but many of his watercolors, paintings, and ceramics were housed at his family compound at Shearwater until they were damaged or destroyed when Hurricane Katrina hit the Mississippi Coast in 2005. Conservators have sought to save and restore his work.